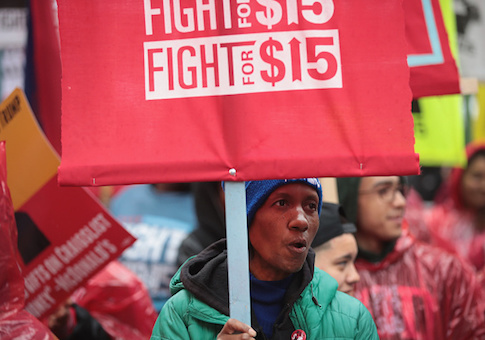 Academics, workers, and small business owners say the Democratic push to raise the minimum wage to $15 an hour could cut 2 million jobs and hurt the workers lawmakers are claiming to help. On Wednesday, Democrats led by Sen. Bernie Sanders (I., Vt.) introduced a bill to raise the minimum wage wage from $7.25 an hour to $15 by 2024, while also eliminating the tipped wage credit by 2027. "The current $7.25 an hour minimum wage is a starvation wage," he said. "We're going to have a minimum wage that is a living wage." Prof. David Macpherson, chairman of Trinity University's economics department, said that such an increase would be unprecedented, but not in the manner Sanders describes. While only 3 percent of hourly workers work under the minimum wage today, the increase would instantly bring 44 percent of them under that umbrella. Despite that large increase, it would not alleviate the poverty rate as employers, particularly small businesses, eliminated jobs to offset the increased costs. Macpherson, using Congressional Budget Office methodology, found that 2 million jobs would be lost under a $15 rate with the most heavy losses coming in poorer states. "The job loss would be greater in Mississippi than wealthier states like New York," he said. Heidi Mann, who operates a small franchise business of Subway restaurants in Washington state, said that the threat of lost jobs and shuttered businesses is real. She was forced to lay off four of her seven employees at a Seattle location after the city passed a $15 minimum wage and shortened the business hours to make do. Her Seattle location will most likely shutter by March of 2020 as customers go elsewhere. She expects the same thing will happen across the country if the $15 rate becomes the law of the land. Workers will bear the burden, she said, pointing to the fact that she can no longer take a gamble on inexperienced employees. Most workers at her suburban Kirkland location are teenagers, compared to the pair of middle aged workers that staff her Seattle Subway. "These significant [increases] will not only lead to job loss, but our workers will lose out on building their work experience," she said. "It's been frustrating and deflating to watch." Susan Kochevar, the owner of 88 Drive-In Theatre in Colorado, said her business has already taken a hit since the state raised the minimum wage to $12 an hour. She has been forced to cut her workforce to deal with increasing labor costs and payroll taxes. The move to $15 an hour could prove fatal for small business owners. "The tax cuts … really helped a lot of small businesses in Colorado, and that will help us ride that minimum wage increase, but to increase it again will [hurt] small businesses," she said. "My labor expenses have already gone up, and I've had to get by with fewer people." Democrats unsuccessfully pushed for minimum wage hikes under the Obama administration with the more modest goal of $9 and $10.10 an hour nationwide, but were unsuccessful in a Republican-controlled Congress. The measure has not only raised the dollar amount, but the scope of the hike. The new measure seeks to eliminate the tipped credit by 2027. Tipped employees, such as waiters and bartenders, earn $2.13 hourly, though businesses pay them the full minimum wage if they fail to reach it through tips. Valerie Graham has worked in restaurants for more than 20 years and is a bartender at Jack Rose Saloon in Washington, D.C. She helped organize restaurant workers to oppose a referendum to eliminate the tipped credit in D.C. in 2017. After voters approved the measure, she successfully lobbied the Democratic City Council to overturn the results and preserve the current rates. She said the $15 wage rate would cause a "massive upheaval" for restaurants and force businesses to close. "It is one of the few fields where someone without a high school diploma or experience … can earn a middle class life," she said. "The most vulnerable people in our industry will not be helped by the reckless disruption of our industry." Graham said she "it was disheartening" that the legislation is being pushed by politicians that many restaurant workers support. She did not expect to have to fight the same battle before Congress that she did at the city council and hopes that workers will be given a seat at the table instead of the labor activists who claim to advocate for their interests. "So many of us in the industry identify as progressive and liberal and to see luminaries of the progressive movement stake a position that is anti-worker is daunting," she said.